It seems appropriate that we are hunkered down here in the house today, like everyone else we know, waiting out the rain and wind of Hurricane/Tropical Storm/Rather-Wet-Zephyr Irene. I’m perfectly happy to sit still for a while- for the last few days we’ve been racing around at a breakneck pace trying to squeeze ten pounds of summer into a one pound bag and frankly, I’m bug-bitten, sunburned, and exhausted. Among other things we managed to squeeze in a visit to the Washington County Fair. 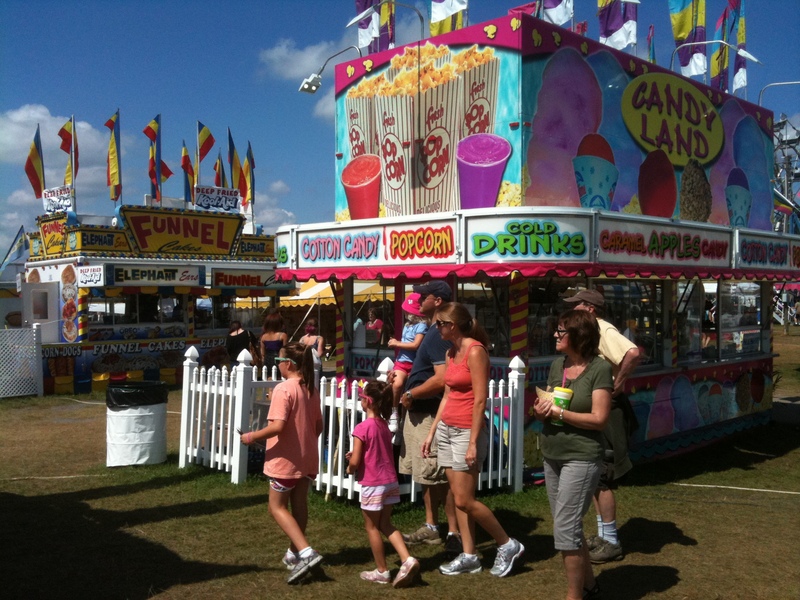 Although it’s a hallowed, end-of summer tradition around here, we’ve never been and in fact, I realized, I’ve never been to a county fair of any sort. But now I’m hooked. Because of course what this event celebrates is time. You can’t have an animal and care for it properly without time. And appropriately, this reminds me of food and how, as a culture, we supposedly have no time for that either, anymore. This connection makes sense: every one of these animals originally gained it’s position on the farm as either a direct provider of food or to aid in the production of it. Wandering around the goat and sheep pavilion it gave me pause to read the signs above the brilliantly groomed animals detailing their names, the intricate names of their breeds, and then that their job was: “Meat.” To a modern sensibility this seemed incongruous- isn’t meat a lowly thing, not to be named or well cared for, but to be shunted to a back lot, fed a diet of mud and antibiotics, slaughtered in secret, before being shipped anonymously out, to be consumed without a thought? Pardon me- as a former twenty-year vegetarian I tend to get a little melodramatic on the subject. Today, as an enthusiastic meat-eater, I am no less concerned with the animal’s well-being and the obvious relationship that holds with the fact that we are then putting that animal as food into our bodies. After all, they taught us in elementary school that “you are what you eat,” so who wants to be a poor, miserable, doped-up, factory-farm creature? But we just don’t have the time or money to worry about that- that’s the cultural message we hear from all around us- our society needs to make progress, move forward, spend more time interacting with technology and less and less and less time worrying about the Hot Pockets (Now in “Nuclear Waste Flavor!”) they we are putting in our mouths. I know. I’m sounding evangelical and I apologize. The funny thing is, that even at this event which seemed to celebrate the very point that I’m ham-handedly trying to make here- ie: that good, healthy food connects to a longstanding agricultural tradition of good, healthy animals- even here we were simultaneously confronted with the equal and opposite message- namely: eat crap! It’s delicious, cheap and fun! You know where I’m going with this. As we made our way further and further from the animals and closer and closer to the midway, we encountered an astounding array of junk for our perusal: buckets of fries! Giant bags of Kettle Korn! Slushies that glow in the dark! Sodas too large to carry! 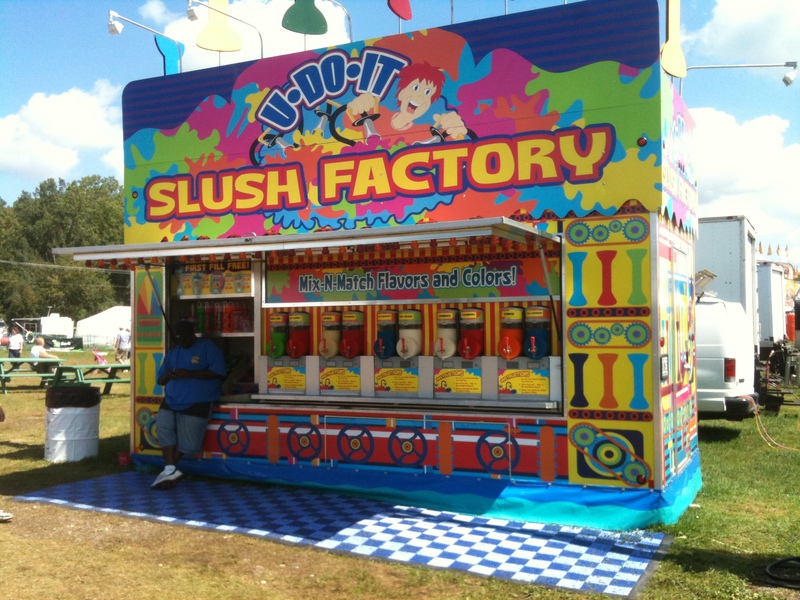 My kids were anxious to get to the rides, and were impatient with me stopping every thirty seconds or so to take pictures of the gastronomical Sodom and Gomorrah. I couldn’t help it- what has happened? I wondered wide-eyed, what have we come to? In his interview with Nightline, Dr. Robert Lustig compared our modern food court to an opium den; here at the carnival this unsettling image of debauchery and debilitation seemed entirely too appropriate. Likewise, the audience in attendance that day showed ample evidence of enjoying a diet closer to the midway side of the fair than to the 4-H side. Being substantially overweight was not the exception, I realized looking around, but the norm. It made it easier than ever to believe the recent prediction that by 2030 half of Americans will be obese. Not overweight, mind you: obese. Are we worried yet? Earlier that morning as we prepared to make the forty-minute drive to the fairgrounds, I had quietly grumbled to myself, annoyed at the work involved with preparing a picnic lunch to bring and lug around with us all morning. It took time. It was heavy. All I wanted to do was leave– why couldn’t we just be normal? I whined to myself. Why did I have to torture our family with this No Sugar Madness? Wasn’t I just being selfish and pushy and fanatical? But let me tell you how happy I was to have that lunch when we started to get hungry… which wasn’t very long after we had arrived and meandered through a few exhibits. Already we were famished. We sat on a picnic bench under the shade of a big pavilion and devoured our cheese and tomato sandwiches, crackers with peanut butter and a small basket of plums like it was air- we breathed it all in. And after eating? I felt really, really good. You are currently reading A Year Of No Sugar: Post 68 at Eve O. Schaub.